Published in early 2006, this is an updated and revised version of a book that I wrote in 2000 for the hp 39g+. This version was also written under contract to HP so they own the copyright but you can download it as a free PDF file (~4.5Mb). This document is fully indexed and hyper-linked and contains chapters on Tips & Tricks, programming, and using the CAS (for 40gs users) plus many other topics. It is written in a much more detailed and user-friendly fashion than the manual that comes with the calculator. To download the file and save it so that you can view it offline, just right click on the link below and choose the option "Save target as..." (or "Save file as.." etc) from the menu that pops up. Anyway, click here to view or download it. Please note that at the time that this manual was written I was beta testing a new version of the Connectivity software that integrated the current communication and editing software into one. I was told that this would be released by mid 2006 but this has not happened basically due to internal politics in HP. This means that some of the instructions on this aspect are not quite going to read correctly. 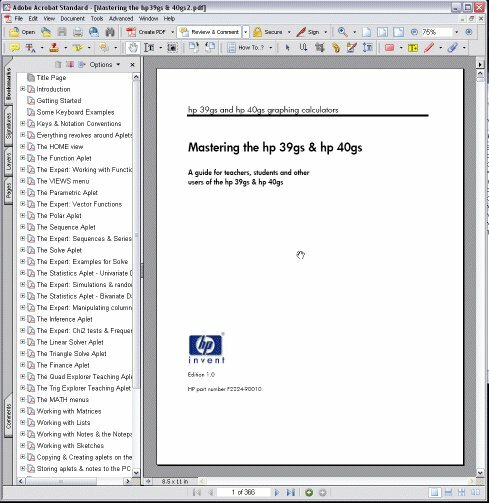 If you still have the old software and want instructions on how to use it then read the appropriate chapters from the manual for the hp 39g+. This can also be found on my Help page.